Bonjour! I hope you don't mind my writing in English, but I wanted to thank the lady in the photograph with me for a wonderful visit and degustation last Sunday. It was our final day in Bourgogne and I had tasted many wines from Beaune to Puligny in almost every village but not in Santenay! I believe she is retired now and just works for you on Sunday. I regret not getting her name, but it was one of the BEST degustations of our two weeks visit, informative and good fun too. She is a charming lady and I would be most grateful if you would tell her how much I enjoyed her help and give her my thanks. 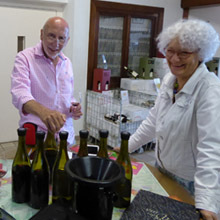 I will write more on our website about your wines in a few days and hopefully visit again next year. Merci! We have just finished visiting Meursault with AB and we cannot drag ourselves away from her! This visit has been rich in emotions, fascinating, exalting. 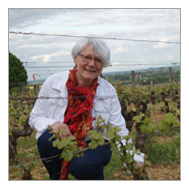 Aleth talks about the history of wines, the grape varieties, the wine-maker traditions and the culture of wine like a storyteller, with a wealth of little details, suspense and anecdotes. We began our tour up in the vineyards above Meursault, to discover an amazing panorama but also to steep ourselves in and to understand the separation of the parcels, the different appellations (regional Burgundy, Village, 1er Cru, Grand Cru) linked to the often little-known historical past of this wonderful region. If you are lucky , you can even catch a glimpse of the Mont Blanc. Then we went down again into the centre of the village to visit the church, to see the Chateau and to evoke the origins and history of the winemakers as well as their winemaking traditions. We drank in Aleth's words, eventually understanding that the richness that she was passing on to us was none other than the story of her own life. AB has the gift of plunging you into this wine universe in Meursault and Burgundy , making you forget the passage of time. But the time to return to the capital (Paris) is upon us and with much regret we must part... well, after a last brief moment together and with a little tasting to continue sharing her simplicity and her authenticity. Thank you ever so much, AB. We hope that one of these fine days , we will cross your path again.